Welcome to our store. We offer guaranteed satisfaction with a FULL REFUND if you are not satisfied. We do this because we strongly believe in the benefits of the Acai Berry, and are building our business for the long term. We are confident that you will be pleased with our products and customer service, and will become another return customer. Donai??i? ?t forget to tell your friends! Acai KickTM EXTREME! is our latest weight loss blend. This is twice as strong as the Acai Kick Original. This advanced diet and energy formula is an effective fat burner, appetite suppressant, and energy booster, making it possible for you to see results in your weight loss program quickly. NOTE: Capsules now comes in resealable pack. Acai KickTM ORGINAL is our ultimate weight loss blend, for those who want a fast track to losing weight.This advanced diet and energy formula is an effective fat burner, appetite suppressant, and energy booster, making it possible for you to see results in your weight loss program quickly. The Acai Kick Package: Looking for the ultimate health diet blend? The Acai Kick Diet Plan is specially blended to work together to get you to your ideal weight. 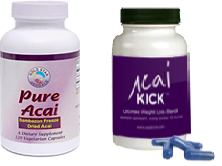 Check out www.acaikick.com for testimonials and diet plans. Acai Berry Pure is made from 100% pure freeze dried Acai berry pulp and skin. The care taken in harvesting and processing result in the highest ORAC value of any Acai supplement on the market, at 580 umole TE per each 500mg capsule. The freeze drying process allows it to retain its taste, aroma and color, and unlike other products which may be spray/drum dried or marketed as extracts, it contains the most concentrated natural form of all the acai nutrients. Free Acai Diet Extreme 3-Day Sample PackAi?? Unrefined pure 100% organic certified freeze dried acai pulp powder and organic certified Amazonian camu camu fruit to ensure full antioxidant absorption. No fillers, preservatives, carriers, caffeine, sodium or sugar. Our freeze dried acai powder is the most concentrated, potent and natural form of acai on the planet! We do not use the seed of the acai, the seed is classified as a filler and dilutes the acai, beware of claims using seed it is a cheaper diluted version. 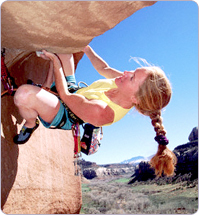 Our freeze dried Acai powder capsules are the only acai powder capsules on the market made of just pure organic acai. They have added organic certified camu camu fruit (Less than 6%) that is loaded with 50x more natural vitamin c than an orange. The camu camu fruit helps with rapid and full absorption of the incredible acai antioxidant properties and also increases the ORAC naturally due to its high vitamin c content. We are the only company in the world offering this type of Amazon fruit powder. How can you tell quality acai? Place a small amount of our organic acai powder into your hand and you will see that it is a dark rich purple and the powder clings to your hand because of the rich omegas 3, 6 and 9. Taste and smell the powder and compare to all other brands. We guarantee we are the only company in the world making 100% pure organic acai freeze dried powder containing no binders, fillers, multidextrin or carriers. We sell nothing but the purest top quality 100% organic acai products. Beware of all free trial offers on acai products online, all free trial offers are offering placebo corn starch filled capsules with less than 5% actual spray dried acai. Quality comes with a price and is not free. Ingredients: Organic Acai Freeze Dried Powder Organic Freeze Dried Camu Camu Fruit (our blend with Amazonian camu camu fruit allows for maximum absorption of our acai). Suggested Use: 2-6 capsules daily. Storage Instructions: Store unopened container in a cool dry place. Refrigerate after opening. 30g of powder per bottle. 60 count capsules in each bottle. 500mg ea. Our product is unrefined, unfiltered, pure 100% Brazilian organic acai pulp and is sweetened with just a touch of organic concord whole grape puree, not grape juice. Adding just a touch of the organic concord whole grape puree, is necessary perfected it to bring out the exotic taste of the acai and take off the tart edge. There is no added sugar this is the world’s purest and only 100% organic and 100% natural acai nutraceutical liquid product that is preservative free! If you’re taking a non-organic antioxidant, then you’re wasting your money. Non-organic products contain pesticides and toxins. Antioxidants remove these toxins from your body, therefore, if your product is not organic and chemical preservative free then you’re filling your body with harmful pesticides and toxins, the whole purpose of an antioxidant is to flush toxins, not add them. Ingredients: Organic Acai Pulp Puree, Organic Concord Grape, Natural Flavor, Natural Citric Acid (To balance ph). Made with organic certified freeze dried acai pulp powder and organic certified Amazonian camu camu fruit to ensure full antioxidant absorption. No fillers, preservatives, carriers, caffeine, sodium or sugar. Just pure organic top quality freeze dried acai. We do not use the seed of the acai, the seed is classified as a filler and dilutes the acai. Unrefined pure 100% organic freeze dried acai. This is the most concentrated, potent and natural form of Acai on the planet! There are no other ingredients and it is 100% organic! There are no carriers or fillers, just 100% pure freeze dried organic Aca.! Did you know it takes 10kg of our pure Acai pulp puree juice to make just 1kg of our pure Acai freeze dried powder? Our freeze dried acai powder is the only acai powder on the market made of just pure organic acai, and it is now new and improved with added organic camu camu fruit that is loaded with 50x more natural vitamin c than an orange. The camu camu fruit helps with rapid and full absorption of the incredible acai antioxidant properties and also increases the ORAC naturally due to its high vitamin c content. We are the first company and only company in the world offering this type of Amazon fruit powder! How can you tell quality acai? Place a small amount of our organic acai powder into your hand and you will see that it is a dark rich purple and the powder clings to your hand because of the rich omegas 3, 6 and 9. Taste and smell the powder and compare to all other brands; we guarantee we are the only company in the world making 100% pure organic acai freeze dried powder containing no binders, fillers, multidextrin or carriers. We sell nothing but the purest top quality 100% organic acai products. Ingredients: Organic Acai Freeze Dried Powder, Organic Freeze Dried Camu Camu Fruit (or blend with Amazonian camu camu fruit allows for maximum absorption of our acai). 90g of powder pure jar, 3 times as much powder per jar as in a bottle of our capsules! Comes with a 3g scoop inside. Suggested Use: Smoothies health shakes, blender drinks, baking ingredient or add to yogurt. Not 100% water soluble. Valid for up to 6 months. Factory sealed glass jars.